Do you want to be known as the neighborhood grillmaster? Need a more fun, vibrant atmosphere for social gatherings? Maybe you and your family want to simply enjoy a little more of the outdoors together from the comfort of your own home? Building a deck can add both fun and functionality to your home! Your new deck can be exciting, but it’s important not to rush into the process too fast. Decks are an investment and add equity to your home. A faulty deck could lead to structural problems or personal injuries. This is why it’s important to find an established local contractor. If you use someone who doesn’t have as much experience, you could be making a big mistake by sacrificing the quality your deck needs to have. 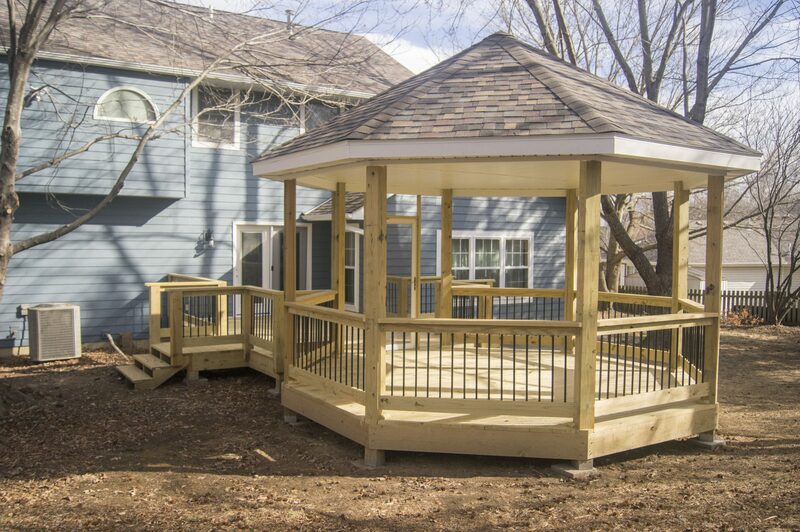 Our team has worked hard to establish TrueSon Exteriors as Columbia’s premier deck building company! We pride ourselves on our detail oriented process to give our clients the piece of mind they’re after, and feeling comfortable with their choice to hire us. Part of this process includes sitting down with you to discuss your ideas and ensure we build the deck of your dreams! Don’t forget to check out our project gallery for examples of some work we have done and Our Process page to get an idea of the timeline your project goes through! 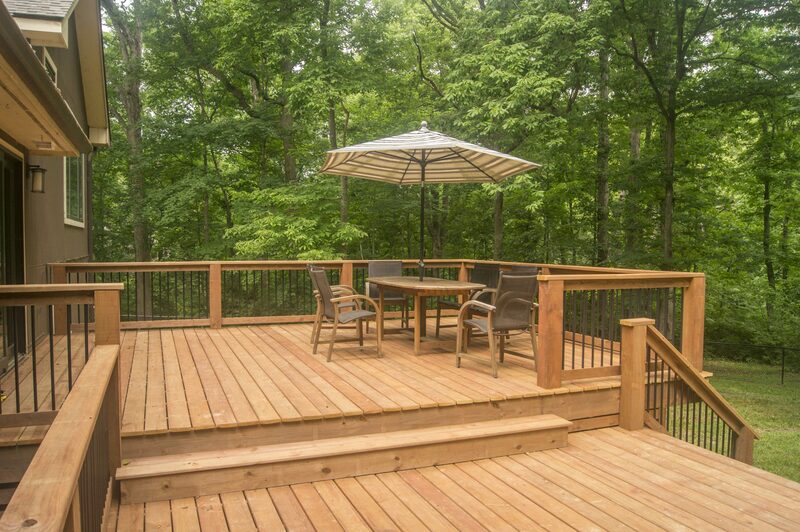 When you build a deck you have two choices for materials: a wood deck or a composite deck. Wood decks are the most common, however composite and synthetic decks are gaining popularity as they’re more resistant to harsh weather patterns. Both wood and composite decks have their advantages, and we will walk you through your options and help you make the best choice for your investment. You can enhance your backyard with a beautiful patio deck from TrueSon Exteriors! Backyard decks are extremely common, and a well-designed patio deck will provide style along with function to give your home a more contemporary look. Tell us about your patio ideas and we’ll provide you with many different options during our initial consultation. Pool decks can be a great addition to your backyard. From making it easier to clean and treat your pool, to sunbathing while the kids splash around, an above ground pool deck is the perfect finishing touch to your backyard oasis! Screened-in decks and screened porches are great for those who want a new deck but also want to escape the heat of a mid-Missouri summer. Complete your screened-in deck with some outdoor furniture and a ceiling fan, and you won’t ever want to leave! At TrueSon Exteriors, we don’t just build and install new decks, we’re also experts in deck repair! 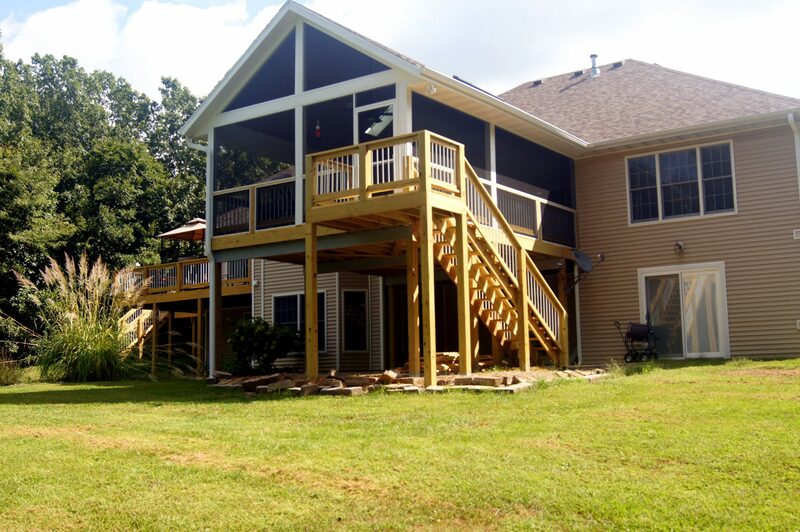 From building supports for structural weaknesses, or reattaching loose handrails, our trained professionals have plenty of experience with repairing all sorts of decks! We stand behind our work and offer our customers a five-year warranty on our all of our home remodeling and construction projects, which includes wear and tear from the unpredictable Missouri weather. GET A FREE ESTIMATE FOR EXTERIOR OR INTERIOR WORK!